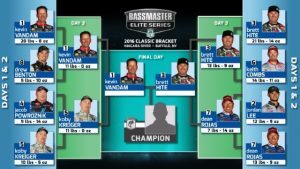 BUFFALO, N.Y. — A blowout and a tiebreaker made the semifinal round of the Bassmaster Classic Bracket event on the Niagara River a must-watch six-hours on Bassmaster LIVE being streamed on Bassmaster.com. 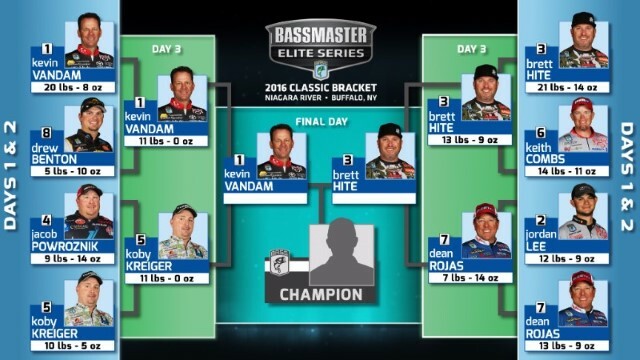 Arizona’s Brett Hite will face Michigan’s Kevin VanDam for the championship match tomorrow to determine who receives $10,000 and a berth in the 2017 GEICO Bassmaster Classic presented by GoPro. The first-of-its-kind competition is being played out entirely live and is shown using Bassmaster LIVE technology. Fans watch competitors in side-by-side screens as they fish for bass on the Niagara. Their catches are weighed by a tournament official in each boat, and the fish are released immediately. This semifinal round was rich with drama. VanDam faced Florida’s Koby Kreiger. It looked as though the Michigan superstar would be able to coast through the match until Kreiger made a big move and found several bass where he landed his only keeper yesterday. Kreiger clawed from a 7-pound deficit to take the lead with only two hours left in the round. VanDam, however, fished his way back one 6-ounce cull at a time and tied Kreiger at 11 pounds with only 20 minutes left in the day. Kreiger hooked up with 10-minutes to go, and the fish came off. That smallmouth swam away with his only chance for a Classic berth, as VanDam won the tiebreaker (based on the angler with the heaviest one-day catch from the previous round). “Man, I almost screwed this deal up,” VanDam said. “I knew Koby was struggling, so I wasn’t going to hit my best stuff today. Then, when I saw him start catching them with a really good average weight, I knew I had to get serious. As for Hite, who was matched against fellow Arizona angler Dean Rojas, the day was far more relaxing. He landed 13-9 in the first hour of competition and simply chilled out the rest of the day. Rojas could put together only 7-14. B.A.S.S. emcee Dave Mercer, who told the anglers at the beginning of the event that there would be a slight format change the final day, announced the change for the championship round. 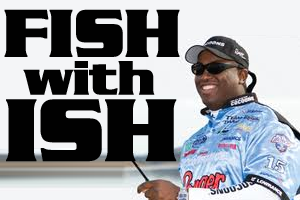 “Instead of fishing for a five-fish limit tomorrow, all legal-size fish caught will be weighed by the B.A.S.S. official on the boat and counted before being released.” This wrinkle will create an all-new atmosphere of competition for the anglers. With weights starting from zero again, the anglers will fish head-to-head from 8:30 a.m.-2:30 p.m. ET for the title. 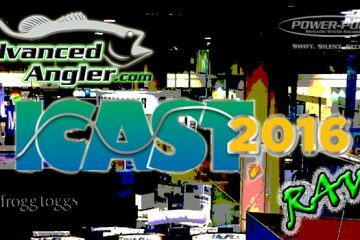 Bassmaster LIVE will stream coverage of the entire match in real time on Bassmaster.com, from first cast until the fishing stops, with a camera in both boats.